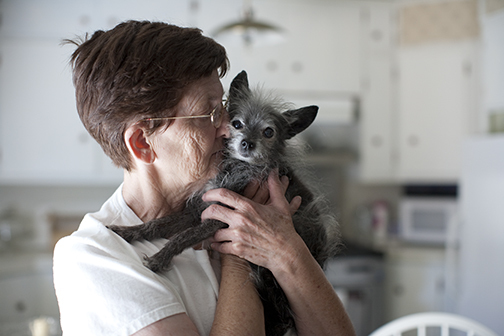 This is a place where I can share the photographs and stories from my travels across America photographing senior dogs. 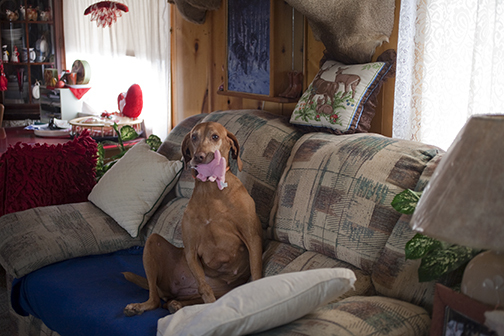 I will feature some of the wonderful dogs I met along the journey and share their stories. 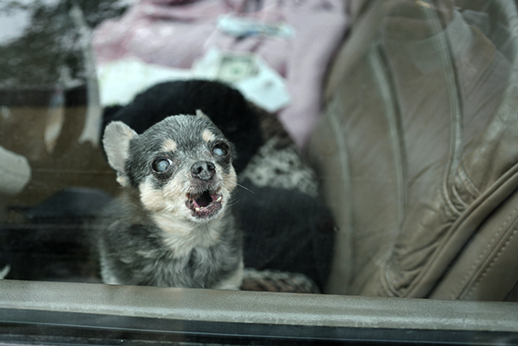 When I arrived in Juneau, Alaska, the Pet Nanny introduced me to so many senior dogs. What was so startling to me was that I expected to see mostly ‘Alaskan’ type mush dogs and instead found this frail Whippet and Italian Greyhound. Forget about the rough and tumble cliche of Alaska. These dogs were cared for with so much gentleness and top vet attention. For almost my entire time living in NYC, I shared my city life with a dog(s). Babe traveled with me to Paris for my fashion shoots. Maxie absorbing the serenity rarely seen in NY. Manhattan is a wonderful place for a dog to be old. Most likely the apartment is over heated in the winter, there is an elevator, flat landscape with lots of pavement, an infinite amount of smells, and lots of people and dogs to stay engaged in life. There is also a very huge nature sanctuary called Central Park where the scariest animal is a squirrel. You can see why this is such a great place to be old. Calvin, 14 years old, is followed by a dog walker with innumerable dogs. Crystal, 12 years old, enjoys Bloomingdales. Zachary, 12 1/2 years old, shares this spare apartment in Spanish Harlem. 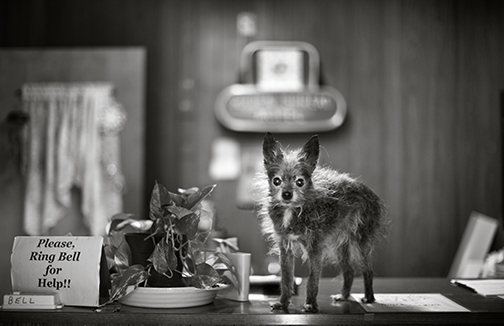 By day, Fritzie, 16 1/2 years old, goes to work at an antique store. Guaton and Diabla, 10 year old siblings, enjoy Central Park. These are my Manhattan choices. Cooper, 15 years old, resting in Central Park at 72nd. street. Poopie, 14 years old, is paralyzed. He has a great view. Princess, Rosie, and Bonnie return to the racetrack in Hileal, Florida. Their fragile bodies are confusing when their instincts are to run. Rosie, 13 yo, Bonnie, 14 yo, and Princess, 14 yo, back on the racetrack. Bonnie in a fragile walk with Princess looking on. They simply just take off. Rosie returning from a sprint. It must feel very strange pausing on a racetrack. 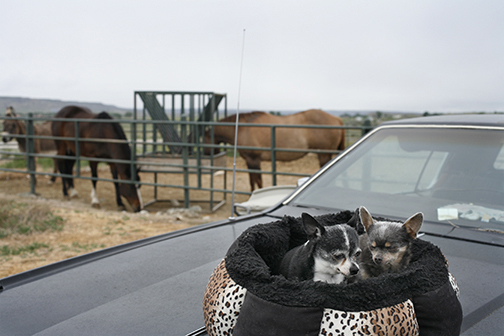 Rosie, formerly Shogun Rose, and Princess, formerly Oh My Princess, pausing at the racetrack in Hileal, Florida. When not racing, it is always this. The alternative to their time on the track. Friends of Greyhounds are dedicated to finding homes for those who do not run anymore. My choice for this project. Rosie leaving her mark on her past. 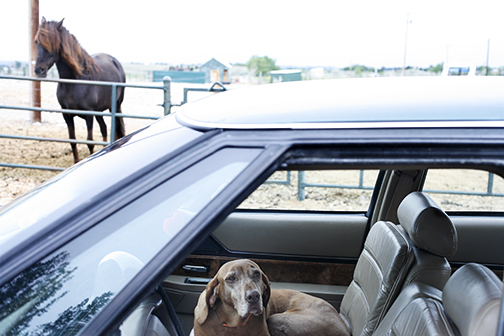 A woman lives in Ralston with senior dogs and horses. It seems she is just getting by in very modest circumstances. She rescues and builds her life around keeping them loved and safe. Carly, 16 years old, with her pink comfort. Her dogs live really long lives. When traveling around America, there are no peripheral judgements. 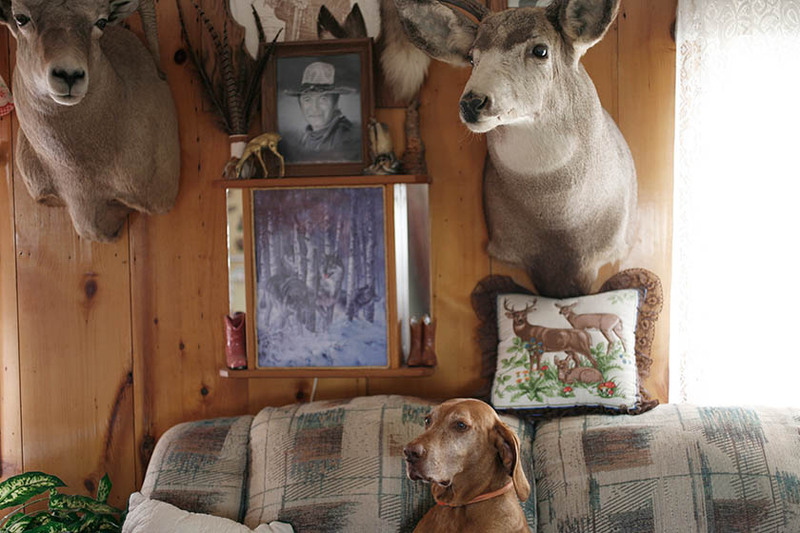 Deep love locates everyone in this photographic journey – dogs and people. Below are the photographs I chose to tell their story for this project. New England. 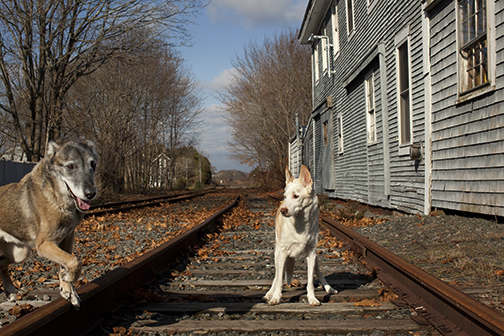 In Sandwich, Massachusetts, I meet Joon, 16 years old, and Rocko, 13 years old. No relation. They have never met before. Joon, 16 years old, meeting the bounding Rocko, 13 years old, for the first time. 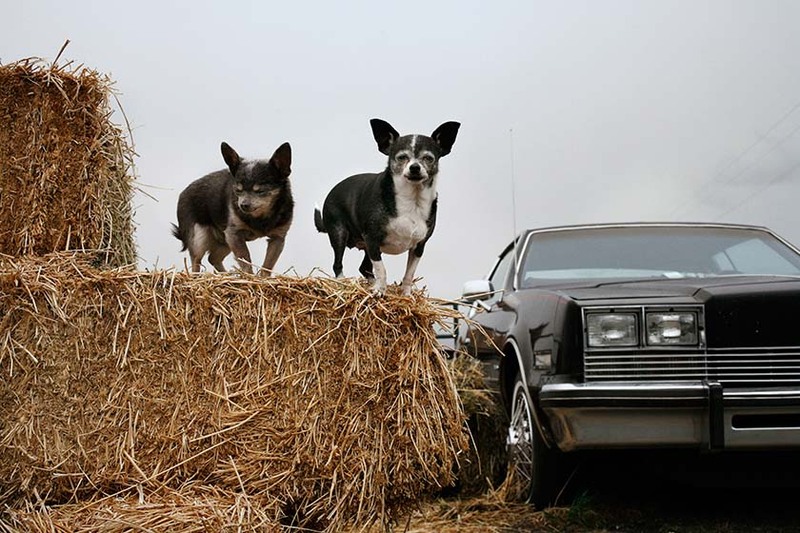 These dogs are not on their home turf . 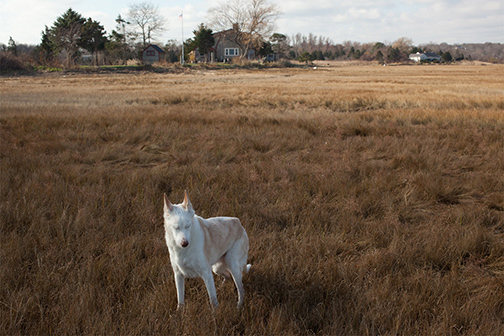 After spending some time in this old town, we head to the marshes. I am in awe watching them take in this expansive new place. Although very fragile, Joon embraces her new environment. Joon’s fragility does not impede her clear desires to smell and move, move, move……. 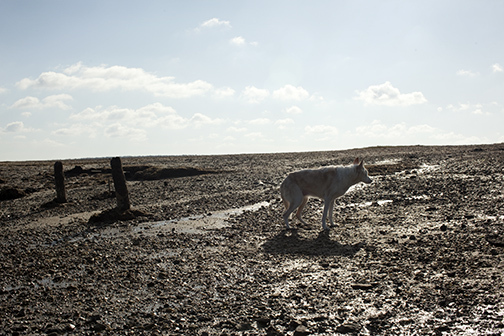 How does a dog reconcile the instinctive desire to explore and still be so very fragile? Here it is. Below is the photograph of Joon that is being collected by the New Britain Museum of American Art. It is the first museum of strictly American art. 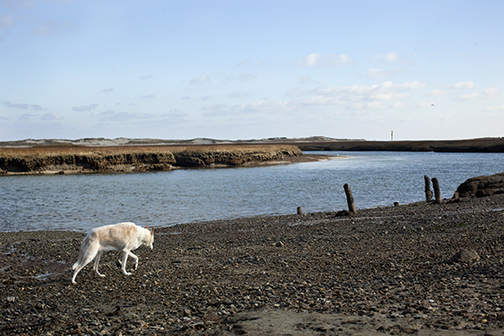 ‘Senior Dogs Across America’ is featured on The New York Times Lens Blog, Lens Culture, Esquire-Russia, and many other blogs. 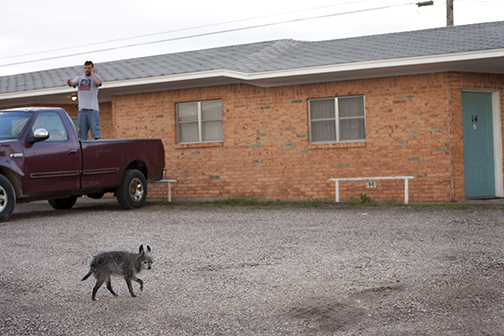 We leave Oklahoma and head for the Texas Panhandle to find the town of Higgins where Jake lives. Jake’s home is a motel. At 16 years old, he appears fully at ease with all it’s comings and goings. 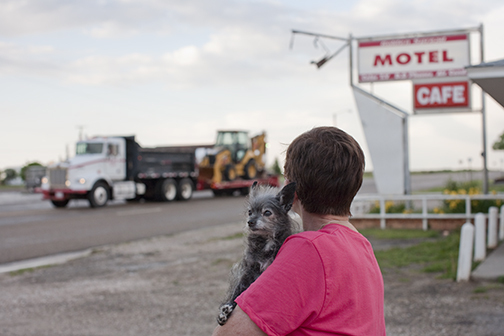 There is a constant flow of truckers, travelers, and even locals, heading down the Panhandle highway next to the motel. His diminutive size appears to cause him no concern. Jake scoping out his territory. Jake likes to take his walks around the motel. He never knows who he will run into but that is a pattern he is very used to having in his life. He really enjoys that first moment when a stranger enters his office to see about a place to stay. His off-duty hours offer profound devotion and love. A tender moment in the kitchen. 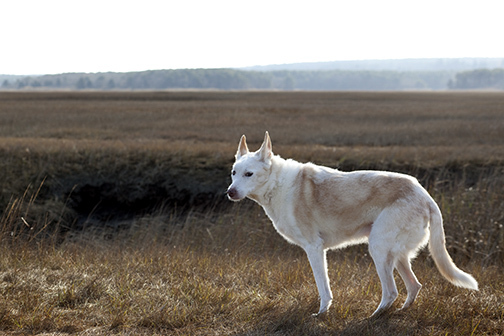 Subscribe and stay updated on all the stories of the senior dogs Nancy meets on her travels across America.